Escape to Broadbeach on the Gold Coast. It’s got all the elements of a classic Australian beach holiday without the fibrolite. 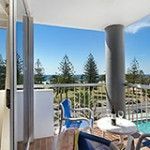 Our Broadbeach holiday apartments have spectacular ocean views, and a location right in the heart of the Gold Coast. 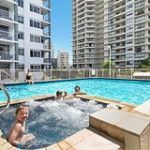 Sandpiper Apartments offer a modern beach holiday experience with accommodation that is clean, crisp and comfortable, and a location that is central to downtown Broadbeach. You’ll find a casual and relaxed part of the Gold Coast that provides a serene counterpoint to hustle and bustle of Surfers Paradise. Here you’ll find the same beach culture that prevails on the Gold Coast, rubbing shoulders with the urban sophistication of Broadbeach. With 194 restaurants appearing on the Tripadvisor review radar, you know finding somewhere to eat will never be a problem. Finding somewhere to satisfy the fussiest of diners won’t be a problem either. No matter your taste, be it stylish, funky or glamorous vegetarian, Broadbeach is bound to have it. 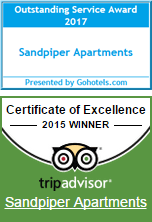 Every one of our apartments face the ocean and include a private balcony. The views get much better from level 3 upwards. 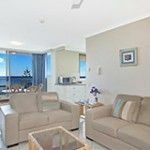 As well as the charm of being so close to the beach, Sandpiper apartments are just metres from the famous Broadbeach Oasis Mall. Our location is convenient in so many ways. Our comfortable, one and two bedroom fully self-contained apartments come with separate bedrooms and bathrooms, full laundry facilities, generous living/dining area and Digital TV and Foxtel, along with Wi-Fi (charges apply) and the usual small appliance array; ironing board and iron, microwave and fridge/freezer.